From the snippet we readers first glimpse of Mrs. Maggie Delamere and Cameron, Viscount Marwood in Eva Leigh’s first WICKED QUILLS book, I knew I was in for something special: Marwood, unimpressed by anyone or anything, looks up and stares as Maggie walks by…. just a small thing but so intense I remembered it. Besides the chemistry, I imagine Marwood’s stare that same sort I must give my favorite authors at writers’ conferences for SCANDAL TAKES THE STAGE is a tale of a fan and an artist, and later, the unlikely love that heals a damaged woman. Yet this is no damsel-in-distress story. Marwood is a rake: over-indulged, over-stimulated, and bored out of his mind. Except when it comes to the theater. Maggie Delamere has a tragic past and it is only through writing she has made any sort of stable life for herself. She writes burlettas, not one of which Viscount Marwood has missed. In today’s terms he’s a theater junkie. And the writer of that art he loves so very much is of great interest to him. But Maggie is wary of aristocrats as it was by an aristo’s callous treatment she experienced the tragedy that caused her family to disown her. Now Maggie is on her own and writing is the means by which she survives except that she has a terrible case of writer’s block. And she is loath to admit Viscount Marwood’s endless badgering and baiting of her is slowly unlocking her art… and perhaps even her heart. In the romance world, rakes are cliché because we readers really can’t get enough of them. What better conquest than to bring a womanizer to his knees? But it’s hard to make a rake stand out with so many of them philandering between the covers (book covers as well as bed covers)? 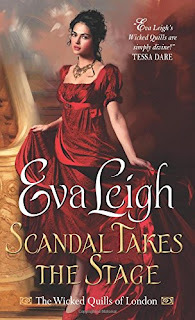 Eva Leigh, however, does just that by giving her rake a sweet dose of, pardon the word, fangirldom--though he’s all that’s virile and masculine. But this “fangirldom” makes Marwood--an otherwise unlikable cad-- sweet and human and endearing. Truly, he’s the main male character I’ve related to most in my long reading life. Marwood is me. He’s also you, if you’re reading this review, because who but a true fan of books would be reading a review on one? And Leigh’s heroine is no less impressive. Maggie Delamere is not only an artist but a true feminist—not the bra-burning sort, but the independence-needing sort. In a sea of historical romance heroines looking for love as well as titles and riches, all Maggie really wants is her independence, for that is her true savior. Though Marwood may heal her heart and help, through true admiration, her art, she saves herself. I related to her, as well, especially with her struggle with her art and her effort to remain true to herself. Eva Leigh’s writing is very fine work. It’s clear she’s a gifted, experienced writer who honors the intelligence of her readers. And I can guarantee you I will be buying each and every one of her books from here on out. If you're a fangirl, which authors top your list? Which artists: musicians, painters, actors, etc...? I'm so excited to read this book! If I weren't already a fan of Eva Leigh (and her alter ego, Zoe Archer), I'd buy this book based on this statement alone: It’s clear she’s a gifted, experienced writer who honors the intelligence of her readers. Great review, J! I am a major fan of this series. Both Forever My Earl and Scandal Takes the Stage were extraordinarily good, and I eagerly await the third book, set for release in May 2016. I read the first book in this series, and enjoyed it. I actually have Scandal Takes The Stage on my tbr pile. I am a huge fan of the French Impressionist painters, especially Renior. I discovered the works of Franz Xavier Winterhalter years ago and immediately fell in love with his paintings. As I love reading over anything, I don't watch movies or TV so I can't say I hate a favorite there. As for music, Jimmy Buffett, Elvis and Adele are favorites. I'm looking forward to reading Eva's Leigh's novel. The plot sounds very intriguing. Choosing is hard but for historicals I would pick Grace Burrowes and Sue-Ellen Welfonder. For historical fantasy Kathryne Kennedy. Horror is Stephen King and contemporary would be Jill Shalvis. Music would be Garth Brooks and Adele. Art would be my daughter and her boyfriend :) I've not read this series as yet but it sounds good.